After seven months of planning, we are just two days away from African Archaeology Research Days 2013, the yearly gathering of Africanists in the UK, which this year will be held at UEA. We have about 110 registered participants. We will have a couple of keynote papers, plenary session papers which will deal with Kenya, Tanzania, Benin, Mali, Senegal, Libya, the Sahara as a whole, the UK, Sudan, and the Western Sahara. Focus discussion groups dealing with archaeology and development, museum collections, the Indian Ocean system, and ritual in archaeology will consider those and other parts of the continent and bring the plenary session participants up to date with burning thematic developments in the field. The fun starts at 9.15 Friday. Most of last week was taken up with our yearly steering meeting or with its preparations. Eight of the Europe-based team members gathered in Norwich to discuss two main things – on the one hand, progress so far and what that means we still need to do in the 2014 fieldwork; and on the other, plans for publications. Generally speaking, pieces of the jigsaw are really starting to come together since we started our first, initial, foray into the Dendi past almost three years ago. Matters are certainly making more sense than they did then. In particular – and fantastic news, given our focus on the spatial patterning of material culture – we are seeing emerge a real division of ‘our’ region into distinct zones of material and technical practices. Weaving, ironworking, recent pottery techniques, surface ceramics, settlement foundation, all see a hiatus in the area around Guene. That area will form a particular focus of the 2014 work, partly through test pitting and partly through survey. Another focus will be truing to close the five-century gap we currently have between our latest archaeological data (the radiocarbon dates keep coming in, and still don’t break past AD 1300) and the oral-historical information on settlement dates. This will, unavoidably, mean more test pits. Finally, we have our job to finish at Birnin Lafiya and will be continuing soils sampling, excavation, geophysical survey, and if all goes well ground-penetrating-radar investigations. As regards plans for publication it is now agreed that, as well as specialised journal articles, we are aiming to have a Crossroads volume as a Journal of African Archaeology monograph in 2016. The layout of the book is what we are discussing now, since we could organise it by theme, disciplinary specialism, or chronology. Here at UEA we are these days kept busy with a range of academic and cultural delights. This week sees Europe-based members of the Crossroads team descend on us for our yearly steering meeting. Olivier is going to talk about the long 19th century, Ali about stratigraphy, Didier (if his visa comes through) about northern Benin archaeology, Sam about mud bricks, Paul about soil elemental analysis, Victor about modern house building, Caroline about distinct ironworking traditions, Lucie about hunting, spinning and fishing and Nadia about site clustering; and I will talk about how our progress so far fits the goals set out in the initial application. Priorities for this meeting are to set out the specific plans for the 2014 field season and to decide on our publications. In the context of this meeting we’re unpacking pots, fine-tuning the project database, making an inventory of the small finds and many other cataloguing jobs. 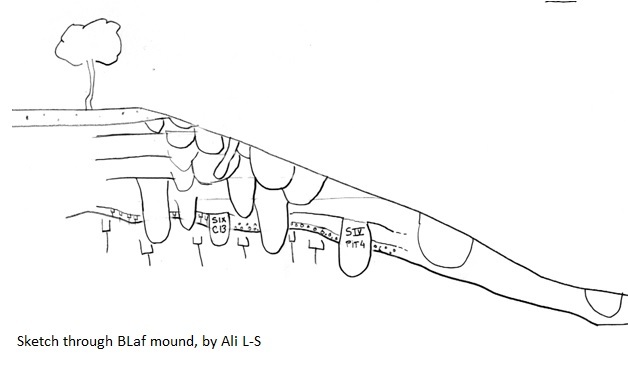 We’re also in the process of applying for funding to run some radiocarbon dates on the exceptional ‘burnt house’ of Birnin Lafiya, and of course thinking ahead to the 2014 fieldwork. This week we’ve taken delivery of several short films by filmmaker Alan McL, who came with us for the 2013 field season; these films will help give substance to our forthcoming Crossroads exhibition at the SCVA. We have also received 5 new dates for Trench IX, the ‘deep pit’. On the 18th of this month we welcome a visiting speaker from Montreal, Sarah Guérin, for our regular Centre for African Art & Archaeology event; she will speak about ivory trade through the Sahara AD 900-1300. On 1-2 November we host the yearly African Archaeology Research Day at which we expect 100 delegates. To cap it all, the Sainsbury Research Unit celebrates its 25th anniversary this year, which has seen us appoint a postdoctoral researcher – Fiona S, formerly Curator of West African collections at the British Museum – and will involve a conference next spring. Tomorrow Norman Foster, architect of the SCVA, delivers the annual Robert Sainsbury lecture followed by a dinner. We have therefore plenty to keep us happily engaged. 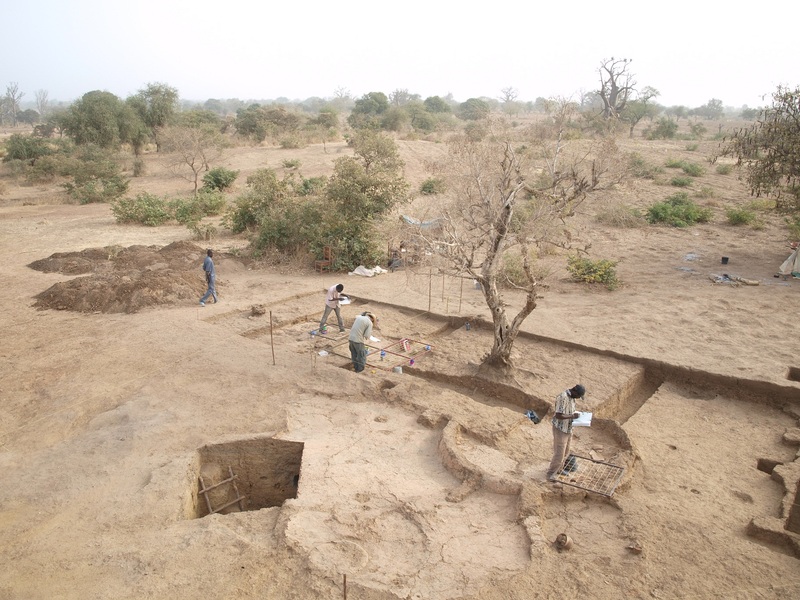 Des arbres et des hommes : La végétation comme indicateur archéologique lors des prospections pédestres en Afrique, apport des connaissances botaniques des habitants de l’agglomération de Birni Lafia (République du Bénin, commune de Karimama) à l’archéologie by Julien Jourand, Université Libre de Bruxelles. Congratulations to all and for those who wish to find out more, most of this work will be presented at African Archaeology Research Day in a few weeks’ time, so please come along to that.